We've briefly mentioned the ProStor line of enclosures in recent articles but consider this article their official coming out party. 1. 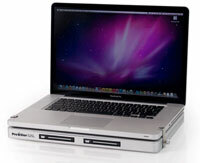 All have the Oxford 934 quad interface (USB 2.0, FireWire 400, FireWire 800, eSATA). 2. The eSATA port doubles as a USB 2.0 port. Included with the enclosure is a hybrid cable that plugs an eSATA connector in the enclosure and has a split cable going to the host with both eSATA and USB 2.0 connectors. 3. The FireWire drives to be Plugged or Unplugged with out turning-off or restarting the computer. The drive mounts automatically when plugged in to the FireWire Port of the computer. In the case of the two notebook enclosures, FireWire bus power is sufficient for operation, though an AC adapter is included. 4. Constructed of smooth industrial aluminum with vent holes, these enclosures dissipate heat so efficiently, no cooling fan is required. This is a slim "laptop shaped" side-by-side RAID enclosure that has bays for two 2.5" notebook drives (either HDD or SSD). It's designed to sit under a MacBook Pro. Clamps are provided if you want to keep it attached to the MBP when traveling. You can also use the 525L with the Mac Pro, standing it on its edge. The drive bays are unique in that they are "screw-less." You pop open the door and slide the notebook drive in. Close the door and you are ready to use the drive. Plus it's a true "RAID in the box" unit. The two micro switches in the back near the ports are used to set the RAID mode (either Striped, Mirrored, Spanned, or JBOD). Keeping in mind that the two drives share a single port, we saw large block READs of 188MB/s with HDDs and 243MB/s with SSDs in RAID 0 mode (Mac Pro with SeriTek/2EM4-E adapter). This is designed, as you can see by its shape, for iMac owners. By sitting on the iMac's base, it provides external storage without taking up added "real estate" on your desk. This enclosure for 3.5 inch SATA drives features easy installation. Requiring no tools, it takes less then 10 seconds to get the drive up and running. Step one: Slide open the door. Step two: Slip the drive in. Step three: Slide the door closed. Step four: Start using the drive. If that sounds too easy, watch this video of a young girl installing a drive in the ProStor735. This notebook enclosure (2.5" drives) is one of the lightest, yet strongest ones we've tested. It can be purchased with or without a drive pre-installed. The ProStor series gives the Mac owner some attractive options for external storage expansion without disturbing the Mac's "Feng Shui." Order from Trans International by clicking on the links in the article.